In the decade or more since publication of the first edition of Understanding Sport, both sport and wider global society have undergone profound change. 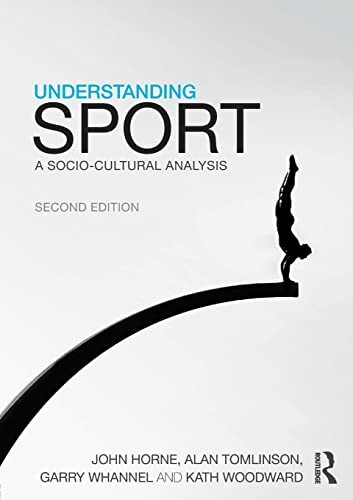 In this fully updated, revised and expanded edition of their classic textbook, John Horne, Alan Tomlinson, Garry Whannel and Kath Woodward offer a critical and reflective introduction to the relationship between sport and contemporary society and explain how sport remains an important agent and symptom of socio-cultural change. Retaining the accessibility and scholarly rigour for which Understanding Sport has always been renowned, this new edition includes entirely new chapters on global transformations, sports mega-events and sites, sporting bodies and governance, as well as a succinct guide to researching sport. With review and seminar questions included in every chapter, plus concise, helpful guides to further reading, Understanding Sport remains an essential textbook for all courses on sport and society, the sociology of sport, sport and social theory, or social issues in sport. John Horne is Professor of Sport and Sociology in the School of Sport, Tourism and the Outdoors at the University of Central Lancashire, where he is Director of the International Research Institute for Sport Studies (IRiSS). Alan Tomlinson is Professor of Leisure Studies and Director of Research and Development (Social Sciences) at the University of Brighton, and has authored and edited numerous volumes and more than 100 chapters/articles on sport, leisure and popular culture. Garry Whannel is Head of the Centre for International Media Analysis, Research and Consultancy (CIMARC) at the University of Bedfordshire, is one of the world’s leading experts on the cultural analysis of media sport, and has written extensively on media and culture for over thirty years. Kath Woodward is Professor of Sociology and Head of Department at the Open University and works in the Centre for Research on Socio-Cultural Change (CRESC) on feminist materialist critiques, most recently in the field of sport, especially boxing. She has published extensively on identities and diversity and on issues in social science. HORNE, JOHN; TOMLINSON, ALAN; WHANNEL, GARRY; WOODWARD, KATH.